The reason I'm writing is because I thought you all might get a kick out of this -- my girlfriend and I went to the taping of The Daily Show last night. Jon Stewart is actually QUITE Jewish (and is pretty knowledgeable about Judaism), and he does a Q&A with the audience before each show. I (of course) had to see if I could bring out any of his latent Jewish-ness, so I told him I was a rabbi and asked him what his favorite Hanukkah memory was... It was very cool. Not all rabbis, however, would be so forthcoming about their profession (especially to a man about to broadcast to millions of people). In fact, Rabbi Mitelman's posting led to an interesting conversation about when to fess up about being a rabbi and when to keep the cards closer to the chest. One female Conservative rabbi married to a male Reform rabbi explained that they had also been to a taping of the Daily Show with Jon Stewart a week prior, but chose to not disclose their professions. She wrote that there are times when she has "not shared that I was a rabbi in order to avoid the inevitable shock, surprise, and ensuing questions. Usually when I am traveling, on vacation, or otherwise outside of my "normal" world, I do not advertise the fact that I am a rabbi, and have often responded that I was a teacher or social worker when directly asked my profession. I am now wondering if I am doing myself and our profession a disservice by doing this. Would it be breaking down more borders and opening up new opportunities to share my profession?" There are certainly times when it makes sense for rabbis not to broadcast what they do. This would be more difficult for the Catholic priest who's collar is a dead give-a-away. I know of rabbis who go grocery shopping many miles from their home so as to experience some privacy. There are also rabbis who wouldn't think of exercising at the local Jewish Community Center for fear of being bothered with work-related questions. Personally, I enjoy working out at the JCC and find that most people are quite respectful of the reason that I'm there (to break a sweat and not play "Ask the Rabbi"). For some rabbis, the setting might dictate whether they "out" themselves as a rabbi or not. Seated next to a fellow Jewish person on an airplane, for instance, if I say I'm a rabbi I could be in for a long flight listening to every reason why Hebrew School was a scarring experience for this individual. Why their childhood rabbi caused them to despise organized religion in general as an adult. Seated next to a non-Jewish individual on an airplane, I could explain that I'm a rabbi and then field endless questions about why Israel doesn't just make peace with her Arab neighbors already, or why some Haredi rabbi was indicted for tax fraud. That would be like a Unitarian minister having to defend Catholic priests for the child molestation scandal. This is the reason why Rabbi Joel Meyers, former executive vice-president of the Rabbinical Assembly, admitted to his colleagues at a convention in 2007 that he often tells the person sitting next to him on the plane that he is either a college professor or a therapist. Ultimately, however, I recognize that I am always a rabbi. There have been times when I'll tell someone that I am a rabbi and it leads to a wonderful and fulfilling experience. The opportunity to teach strangers (both Jews and non-Jews) often arises at the least likely times. I'm sure it's no different than my friend who's a pediatrician not wanting to volunteer her profession when she's on an airplane for fear that she'll have to give medical advice for every ailment that has ever afflicted the children of the woman seated next to her. But in the event of a child getting sick on the plane, I know she'd jump into action without a moment's hesitation. Last month, I was on an airplane returning home from New York. A Jewish man sat down next me. (I know he was Jewish because as soon as he saw I was wearing a kippah, he immediately told me that he's Jewish and that he speaks a little Yiddish.) 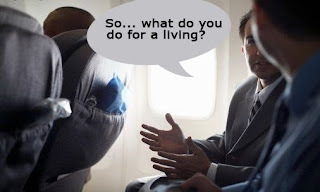 He spent the entire plane ride telling me about what he did for a living. And it was truly fascinating. 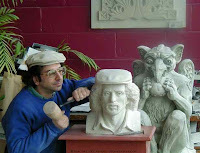 The man, Walter Arnold (pictured), is an extremely talented artist who works with stone. He's designed beautiful fireplaces, breezeways, fountains, and sculptures for some of the most breathtaking homes and churches in the country. Trained in Italy, Walter told me that his art graces the White House, Washington National Cathedral, and the Capitol. He pulled out his computer and showed me dozens of pictures of his work. It was breathtaking. At the end of the flight, Walter handed me his business card and asked for mine in return. Looking at it, he exclaimed, "Wait, you didn't tell me you were a rabbi. I could have asked you so many questions." I explained to him that what he does for a living is much more interesting to me than what I do. I thanked him for the enjoyable conversation. And we said goodbye. I'm no rabbi, but I've worked in conservative synagogues for over seven years. This dilemma is a challenging one. Makes me sometimes wonder what the Hassids get asked. I think as traditional Hebs we can answer questions that might otherwise not get answered or that otherwise might not get asked keeping myths and misconceptions alive. I remember... See More a time when a child in a preschool that rented our synagogue building during the mornings who once pointed at me and started laughing and, through her giggles, said "that man's wearing a Frisbee!!!" Come on Rabbi, you are a RABBI! You are meant to be an ambassador for the Jewish People. You are meant to inspire Jews to be "Jewish!" How can you hide such a thing especially when assimilation is at such a high rate? You must do all in your power to promote Jewish life to Jews and bring Godliness into this world to both Jews and Non-Jews. Being a Rabbi is not a 9-5 profession. It is a life long calling (as I am sure you felt when you first went to Rabbinical school). Being a Rabbi is a way of life lived 24 hours a day, 7 days a week. Keep up your good work and build upon it even more! Spread the Light so that the ultimate Jewish goal of bringing Moshiach and the redemption occurs! I discovered Walter Arnold through your blog. I contacted him and interviewed him for my blog: I SEE BY THE SNAILPAPERS. "Thanks for letting me know about the rabbi's blog. It was a really enjoyable flight and enjoyable discussion we had on board. The <a href="http://rabbijason.com>rabbi</a> told me a lot about the Detroit Jewish community; my wife and I spent a weekend there about a dozen years ago when my daughter participated in the Maccabee Games there, and he was able to tell me about the families we'd met at the time." This is wonderful... thank you for sharing.